There are many ipad users who use ipad regularly but there are some tricks which they would not have used or may not know also. There are people who boast about their ipads but know less about its use. iOS 5 for performing the tricks in ipad. Downloading iOS 5 is free and easy. If you want to know tricks to use a ipad then first enable multitasking gestures. Now the multitasking gestures are ON. People love to play games on iPad.. There will be no one beside when they are playing the game. They go on playing and acquire a large score. At this point, they really want to flaunt their scores to someone who do not believe in their ability. Now there is a trick to flaunt this screen shot. This trick to use an iPad is appreciated. •	Press the on/off button towards the upper right side on the iPad. The careen is taken as a picture shot and is saved in the gallery. This picture is available until you delete in the gallery. There are ladies and men who like to keep their purchases online a secret. There may be any reason but they like to hide it from their partner. Keeping purchasing secrets is one of the tricks to use a ipad. •	The app button turns red from grey which also displays hide. •	Tap on hidden purchases in itunes. In a little time the hidden app appears. Double-click on the home button to get the multitasking tray. Swiping with four fingers also will start the multitasking button. The multitasking tray loads and then it has to be swiped towards right. The brightness of the picture and the volume can be adjusted to get the best. Any music and video can be seen on the ipad now. While working on the iPad this multitasking tray helps in getting into the music and videos. Using many apps is also tricks to use ipads. People prefer to use both their thumbs while typing. For this the keyboard has to be split. When the display of the key board appears try to touch both the sides with the thumbs. Now swiping the edges of the keyboard towards the ends of the ipad the keyboard is split. If again the keyboard has to be joined then touch the edges with both the thumbs and take it closer. •	Sometimes some apps cannot b3e shared with the friends. In such critical situations it is better to kill the app. When a paragraph or a whole sentence on the screen has to be rubbed off then it is better to just shake the ipad. If the deletion has to be undone then another shake will do it. When the number of apps is more then it is better to group the apps. At least twenty apps can be put into one group. Trick to use ipads by stacking the apps. •	In this way at least 400 hundred apps can be grouped and stored on the home screen. There are some apps which has to be on the home screen which occupies space and cannot be deleted. This app is the Newsstand. Many of the ipad users will not used this group. The home screen can be kept clean by these tricks to use ipads. •	When the animation is created for the new group then the app has to be left. To avoid scrolling and getting back to the place which you want is easy with this tip. Get back to the search results then mention the price of the app. This will bring back the app store and thus the user will be intact as before. By using all these tricks to use ipads has made the users to have more features. My black coat refilled passion in my veins. I reached the cellular jail. The breeze is dreadful in itself, but yet I breathe the air in. I had legal permission to meet the mastermind behind the city mall attack of 2012 which engulfed my family within its bloody mess. This is the moment I had waited for all my life for which I counted every minute of my time and survival. It was the best research project to trigger my career with. Finally, I stood in front of that barbaric soul who had destroyed millions of innocent homes and lives. I was petrified to see him. He looked at me with eyes full of regret, annoyance, and abhorrence. No one knows why, maybe because of guilt at his own existence. I felt a sensation in my head in the midst of my thoughts. It was his welcome for me. I was asked by officials to leave but I lived for the day and was not easily going to give up. I entered. Something stopped me. Maybe my mom’s blessings stopped me that always wanted to shield me. But I had to do this for mine and everyone else’s tears that were shed at their loved ones’ corpses. The air smelled bloody and he seemed to be encrusted with dead bodies. I controlled my emotions which heated up as a victim of that attack. Yet I insisted to myself that I was a lawyer here. I glanced at the walls full of paintings and they seemed to be strangely familiar. The house, lady, the boy, the doll, the swing, something was making me quite nostalgic. He burst out crying. I felt his tears, but he had to go. He left. I moved out of that darkness and went to the place where he was going to be hanged. I stood still, awestruck, and a tear fell out of my eyes. He was my father. My hands did not rise. I hugged him tight and called him “PAPA,” my eyes filled with hot blood. My life would now be devoid of the blessed hand of my father. I wish he could meet his daughter in the afterlife, but I don’t know whom I lived for now. Yet I wiped my tears and moved out. I was strong enough by the lash of time to mask myself and bury everything deep inside me. Yes, I was blessed by my mom and dad. MESSAGE: EVERY WRONG ACTION PAYS YOU BECAUSE LIFE HAS ITS OWN WAY TO EDIFY… KILLING MANY WILL DEVASTATE YOUR “ONE”… SPREAD LOVE INSTEAD OF TERRORISM BECAUSE THERE IS SOMETHING BEAUTIFUL ABOUT HUMANITY, SOMETIMES SUPPRESSED BY TERRORISM. Past 2020: A Vision for Tomorrow’s India gives a sharp look at that how much India has gained within few years as well as what lies ahead, to happen one of the main five monetary powers on this planet by 2020. In 1998, Dr. Kalam, and Y. S. Rajan thought of India 2020, a dream archive that graphed the courses in which India could turn into a developed nation by 2020. 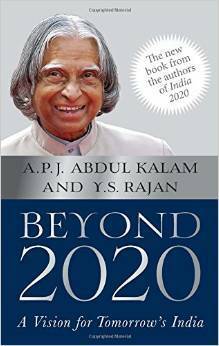 As the year 2020 methodologies, Dr. Kalam returns to the book to take a stock of how much our nation has advanced as well as the things left to accomplish. India’s development had eased off in the 21st century as a result of a few missed opportunities and postpones in project finishing. Dr. Kalam thinks of a reestablished policy concentrating on farming, assembling, mining, and human services. Past 2020 present a plan of activity that will help India change into a progressed nation in very future. India 2020 speaks the truth to turn into a reality. Is it exact to say that we are prepared? Dr Kalam and Y.S. Rajan published in 1998, the iconic India 2020, which is basically vision document for the new thousand years that graphed how India could turn into one of the main five monetary powers on the planet by 2020. After sixteen years, as the year 2020 methodologies, the time has come to take a load of the amount India has accomplished and what lies ahead. From numerous points of view, India’s development story in the twenty-first century has been hamstrung by missed open doors and log jams in task execution; however it has likewise been checked by new open doors and rising advancements that make quicker and more comprehensive development reasonable. There is a great renewed policy is currently required for manufacturing, mining, agriculture, the chemicals business, medicinal services and foundation to empower these areas and support monetary development, contend, Kalam and Rajan. Along with, employment, education, developing new technologies, biodiversity, waste administration, national security and the learning economy are a percentage of the other imperative zones that we have to expand on as we look past 2020. India can at present make it to the rundown of progressed nation in 10 years. Past 2020 give an activity plan to that change. A.P.J. Abdul Kalam is one of India s most recognized scientists, also one of the main responsible for the progression of India’s first satellite dispatch vehicle and the operationalization of vital rockets. He likewise spearheaded India Vision 2020, a guide for changing India. The President of India somewhere around 2002 and 2007, Dr Kalam has been awarded privileged doctorates from thirty-eight universities and the nation’s three greatest honors Padma Bhushan (1981), Padma Vibhushan (1990) and Bharat Ratna (1997). A productive and top of the line creator, he now directs addresses on societal advancement in numerous universal organizations and is included in the examination on distinctive societal missions. Readers often wonder what good writing is all about and maybe think that it is no big deal. When you read Time magazine or even Newsweek, nothing strikes you as quite extraordinary. Perhaps the political slant may seem startling but that was the newsworthy stories and not the writing itself. We do admire the skill of writers in literature when the pages reflect seemingly impossible to document feelings and emotions, the purple prose and the like. What is a good piece of writing? Perhaps the phrase ‘style and substance’ sums it all up. Content wise or the substance part of it should be pithy enough. Without appropriate matter, the best of writing would seem to be quite superfluous. The best substance, of course, would differ according to whether it is political, social, religious, and satirical or amusement. Why do millions flock to humor sites like Cracked.com? Perhaps they do combine the two elements well. Most good writing includes a bit of personal experience besides the humor element. Excessive seriousness would destroy even the best of writing intentions. The ‘I’ often makes a great difference and brings in life to an otherwise drab piece of writing yet research writing shuns it. Since information is often the reason writing exists at all in a range of subjects as diverse as commerce and philosophy, make sure adequate quantities of up to date researched information is included. Names of people and places do spice up writing at the very mention. Media has nowadays caught up with the age old practice of including pictures and videos along with the text. Consider YouTube as an outstanding example. A good grammar book besides a thesaurus and a style directory would all be essential tools to hammer out a good piece of writing. The plan is essential of course and the usual how, who, what, where, when and why approach is even taught in primary school. Drafting, rewriting and finally editing your own work is crucial to reach that streamlined phase of tight expression with no unnecessary words. The Expression would be so markedly different between business writing and creative writing. British and American English have their differences too, but finally it is a happy marriage of style and substance, ideas and meanings besides sentence making and practice. Enjoy the ride! Now that the whole world lives in the shadow of the all-conquering social media, as pervasive as the sun, how best can we exploit the bonanza? If the sun indicates the day, perhaps social media is like the moon too that shines down at night. Now that the print and broadcasting media have been eclipsed by the live social media where messages oscillate the globe within seconds, what else does a small business require to take off confidently into the skies? What kind of small business? While most people stop at Facebook, perhaps the largest fish with well over a billion active users, there exists hundreds more. Twitter, Google, Pinterest, Instagram, YouTube and Linked In are some of the big names too but the list goes on and on. The problem is to circulate messages, text, images and videos across selected social media networks that would be appropriate for the business. Firstly the messages themselves and the images should be carefully framed to deliver the right nuances with changes for each media and build up a following. Things cannot happen so quickly either nor is the process all that simple. A marketing manager would handle the delicate process of trumpeting the business cleverly. SproutSocial.com and HootSuite are websites that gently get you and the business through the process and the fee is not all that high. What it essentially means is that you need not laboriously work on each of the social media voices. They will get things done with all their expertise.